This deadlift bar is built for the biggest and strongest lifters. Load (5) 100 lb economy plates on each side to add up to 1,074 lbs (including 74 lb weight of the bar itself). 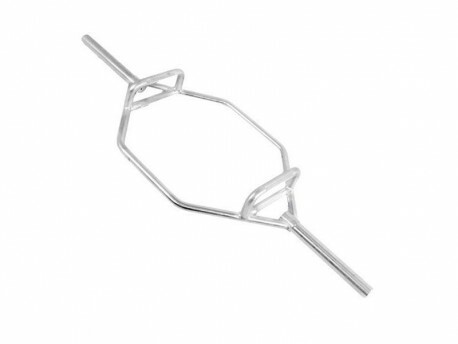 This deadlift bar is zinc coated to resist rusting and has a solid sleeve design. Flip the bar over to change the starting height of your grip. While we sometimes call it a deadlift bar, the movement done with it is closer to a squat. In a traditional deadlift with a straight bar, the bar is in front of you, requiring more assistance from the lower back to pick up the weight. With a deadlift bar like this, the center of weight is aligned with your body, requiring more force from your legs. So while it does require more leg strength, overall it puts the body in a more mechanically advantageous position.